Which Races Are Seeing The Most Early Money And Which Donors Have Given The Most? LANSING — If the early numbers are any indication, you can expect some expensive races for the Michigan Senate in 2018 with many involving current members of the Michigan House. Two primary races between well-funded Republican candidates have already attracted more than $400,000 in campaign cash. And a number of swing districts have attracted more than $200,000. The last time the entire Michigan Senate was up for election brought the most expensive individual state Senate history race in Michigan history. That race in the Kalamazoo-based 20th Senate district attracted about $2.6 million, according to MCFN’s tracking. Candidates had to file new campaign finance disclosures covering the last quarter of 2017 on Jan. 31. The following is a listing of the races that have been attracting the most money, according to those disclosures. Two candidates with health-care backgrounds are drawing money to the 19th District. Sen. Mike Nofs, a Republican from Battle Creek, currently holds the seat but is term limited. State Rep. John Bizon, a Republican physician from Battle Creek, raised $211,284 for his Senate campaign, according to a disclosure. Former Rep. Mike Callton, a Republican chiropractor from Nashville, raised $242,143 for his campaign. Callton’s Senate campaign received $212,491 from his past House campaign. It’s also received $2,500 from the Michigan Association of Chiropractors. Bizon’s Senate campaign received $190,000 from Bizon himself and $10,000 from Bizon’s state House campaign. It’s also received $1,500 from the Michigan Osteopathic PAC. The 34th District seat in West Michigan is open in 2018 and two Republicans who’ve served in the House are preparing for a race. One of them, Rep. Holly Hughes, of Montague, raised about $306,015. Since the campaign launched, Hughes has loaned her campaign a total of $750,000 but repaid herself $500,000 of those loans. Her state House campaign transferred $10,000 to the Senate campaign. Peter Secchia, CEO of Universal Forest Products, chipped in $2,000 for Hughes’ campaign. Former Rep. Jon Bumstead, of Newaygo, raised $137,287 for his Senate campaign. Of that, $51,288 came from Bumstead’s past state House campaign. William Demmer, of Lansing, and David Kelley, of Traverse City, each chipped in $2,000 for Bumstead’s campaign. The open 76th District is expected to be among the most expensive races in 2018 because it involves two incumbent House members. Rep. Chris Afendoulis, a Republican from Grand Rapids Twp., is running against Rep. Winnie Brinks, a Democrat from Grand Rapids. Afendoulis raised $220,338 in 2017. Brinks raised $139,224. Afendoulis transferred about $200,713 from his state House campaign committee to his Senate campaign. He also received maximum contributions of $2,000 from John Kennedy of Autocam and Mark Meijer of Life EMS Ambulance. Brinks transferred $69,454 from her state House campaign to her Senate campaign. She also received $5,000 from MI List, which support progressive female candidates, and $4,000 from Senate Majority Leader Jim Ananich’s Senate Majority Fund. The 24th District is another open seat that both Republicans and Democrats could target in 2018. Democrat Kelly Rossman-McKinney, a businesswoman, raised $179,755 for her campaign in 2017. She’s received support from political action committees (PACs) tied to current Senate Democrats. Sen. Curtis Hertel’s Take Back The Senate Fund gave $3,5000, and Sen. David Knezek’s leadership PAC gave $3,500. Current Rep. Tom Barrett, a Republican from Potterville, raised $60,535 for his Senate campaign. His state House campaign provided $48,000 of that total. He’s also received $2,000 from Randy Wood, of Eaton Rapids, and $1,000 from Matthew Moroun, owner of Central Transport. Another current state House member, Republican Brett Roberts, of Eaton Township, raised $24,855 for his Senate campaign. Of that total, $9,000 transferred from his state House campaign. He also received $5,000 from the Michigan Laborers Political League. 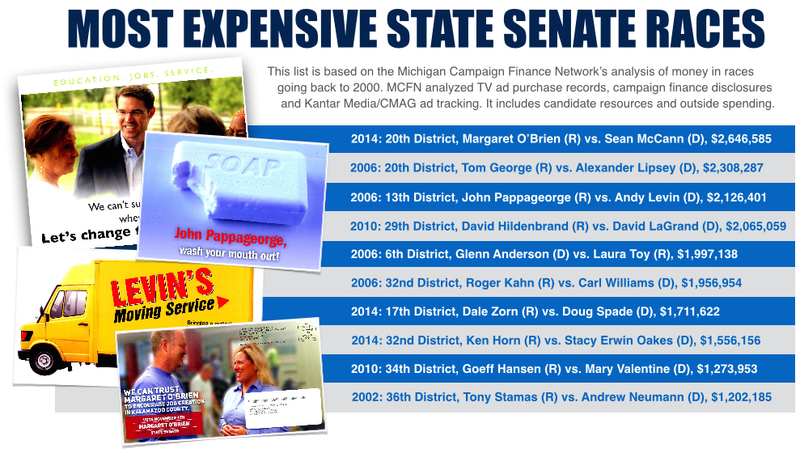 The 2014 race between Republican Margaret O’Brien, then a state representative, and Democrat Sean McCann, then a state representative, is the most expensive state Senate race the Michigan Campaign Finance Network has tracked in Michigan. It cost about $2.6 million, including the spending by groups other than the candidates’ campaigns. McCann, of Kalamazoo, raised $30,229. His top donors include Neil Sikora, of Kalamazoo, who gave $2,000, Larry Bell, of Bell’s Brewery, who gave $2,000, and Shannon Bell, who also gave $2,000. The 7th District in Wayne County is another open seat. Sen. Patrick Colbeck, a Republican from Canton, who’s running for governor, currently holds the seat. Democrat Ghulan Qadir, a psychiatrist from Northville, already collected $98,482. He received $4,076 from a past candidate committee. He’s had about 25 individual donors who gave $2,000, the maximum an individual can give a state Senate candidate. Numerous medical doctors have supported his campaign, including Dr. Nauman Imami, of Northville, who gave $2,000, and Dr. Farah Iftikhar, of West Bloomfield, who gave $2,000. Another Democrat, Dayna Polehanki, a teacher from Livonia, raised $42,527. Polehanki contributed $20,436 of that total. She also received $500 contributions from House Minority Floor Leader Chris Greig’s Women In Leadership Fund and $500 from the International Brotherhood of Electrical Workers 58. Republican Rep. Laura Cox, of Livonia, raised $95,237 for her campaign. Of that total, $86,671 transferred from her state House campaign. She also received $1,000 each from Sarah Kornblum and Stephen Mendelson, of Mendelson Kornblum Specialists. In this heavily Republican state Senate district, two current state House members and a former state House member are competing for the GOP nomination. The seat is currently held by Senate Majority Leader Arlan Meekhof, who is term limited. Rep. Daniela Garcia, a Republican from Holland, collected the most money so far at $171,800. Of that total, $160,000 transferred from her state House committee. She also received $2,000 from John Essex, owner of Port City Ventures. Former Rep. Joe Haveman, a Republican from Holland, raised $31,591. He received $5,571 from his past state House committee, $5,000 from West Shore Majority Fund, which is tied to Sen. Goeff Hansen, $4,000 from Noel and Janet Cuellar, of Holland, and $4,000 from Lee and Linda Visser, of Holland. Rep. Roger Victory, a Republican from Hudsonville, raised $10,300 so far. Victory contributed $10,000 of that total. Victory is the own of Victory Farms. 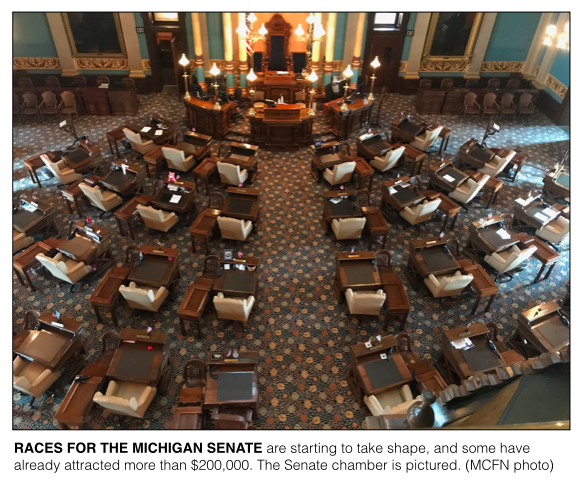 You can do additional research on who's giving to state Senate campaigns through the Michigan Secretary of State's website.